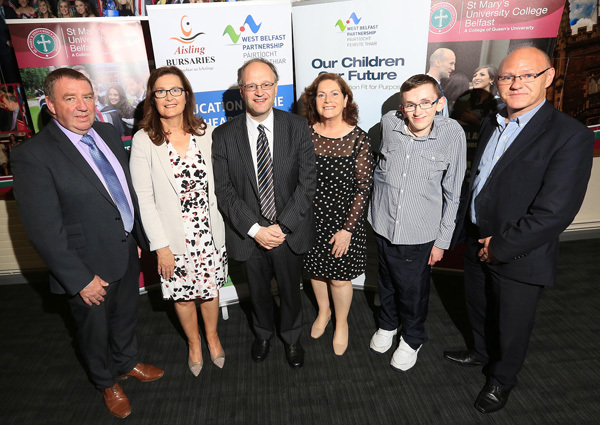 STUDENTS and business donors in West Belfast have been warmly congratulated by Education Minister Peter Weir at the 17th annual Aisling Bursaries presentations. Hosted by the West Belfast Partnership Board on Tuesday night in St Mary’s University College, the DUP man paid tribute to the businesses, organisations and local individuals who provide sponsorship for the Aisling Bursaries and commended the young people who are striving to achieve their potential through education and skills development. She added: “The Aisling Bursaries are an invaluable and effective social justice tool which help provide a level playing field for people from West Belfast. Education Minister, Peter Weir said he was very pleased to have the opportunity to acknowledge the “significant contribution” that the Aisling Bursaries make to supporting people in West Belfast to achieve their full potential through vocational training or academic studies. “This evening 45 new students will benefit from the scheme and will receive Bursaries worth a total of £34,000,” he said. “Schemes such as this make a real difference – helping to improve the prospects and life chances of our young people, the community and future generations. Professor Peter Finn, Principal of St Mary’s University College, who hosted the event, said widening participation in higher education has been the “dominant feature of the university sector throughout Europe in the past few decades”. “This process has sought to redress some of the socio-economic inequalities that exist in all jurisdictions and to promote greater social justice,” he added. “Increasing participation in third-level education is particularly important in the West Belfast area and the Aisling Bursaries Scheme, delivered by the West Belfast Partnership Board, is one of the best examples anywhere of a commitment to help students realise their full potential. At the presentations in St Marys University College, 45 students were awarded a full or part-time bursary from a total of £34,000 donated to the scheme this year. Since 2000, £574,500 has been donated to the Aisling Bursaries, providing assistance to 671 students. Each donor organisation or individual contributes £1,000 for a full-time bursary or £500 for a part-time bursary. West Belfast MP Paul Maskey was also present on the night. “The Aisling bursaries have been a great success over the last 17 years. I want to commend the West Belfast Partnership Board on their commitment to the community of West Belfast. They have shown great leadership with innovative initiatives such as this. Bursaries can be the difference from someone going through university or not as in many occasions it comes down to cost,” he said. See special Aisling Bursary supplement in next week’s Andersonstown News.